Using the Simple.cs script, I was trying to create a L2DViewer like parameter list for integrating into Fungus. 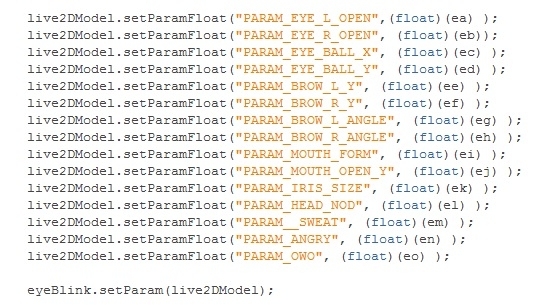 The problem is that because the L2DEyeBlink script also uses the parameters of "PARAM_EYE_L_OPEN" and "PARAM_EYE_R_OPEN", only the latest function would only activate, limiting me to either have a nomal blinking or a steady stare. e.g: this code would only display a blinking character without eye open control, putting the eyeBlink.setParam on top in turn would display a staring character but with eye open control. The solution here was to change the 1's into the variable that holds the eyeopen value in my original script ( (float) (ea) ) in order to become the upper bound for blinking. The problem is, the system does not allow me to execute a getComponent within this function so I could not send over the value. Is there any way I could pass it into the function? Thank you for replying, but it seems that I have managed to have the newer LappProxy to work with fungus and just make the expressions in the actual L2D Viewer. So I'll be closing this.